Surprise surprise! 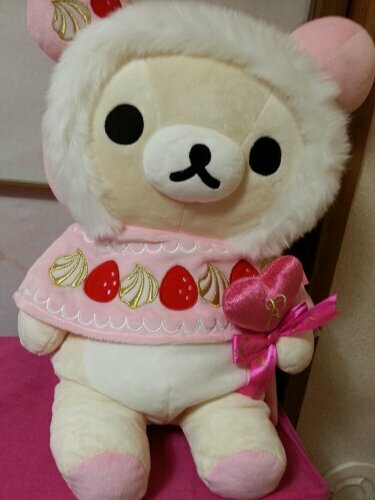 | Angel's Rilakkuma Blog! As I said yesterday, I got an amazing surprise from the mailman a couple days ago, but I wanted to make sure I posted about the Wonderland series release for everyone to check out. 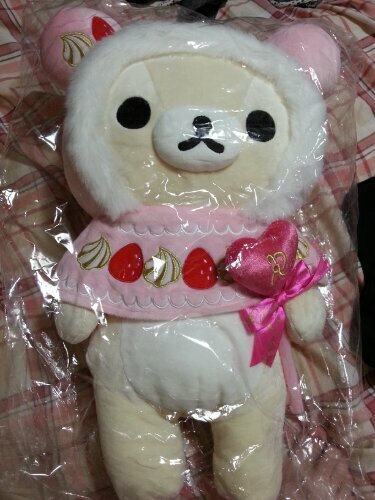 Anyway, so I don’t keep you all in suspense, my pride and joy..
Its Korilakkuma XL size from the Sweets series!!! With her Sweets family ^^ I just need her regular size plushie to complete my set! Im so excited to add her to my collection! She was at the top of my wishlist, and after checking auctions every day, I couldn’t believe when I actually found her. I ended up being the only bidder, and I got her for just $7 more than the retail price ~ unbelievable for such a rare item! My amazing fiancée went through so much effort getting her to me. He was on his way to the gym when she arrived in the mail, so she actually made the trip with him to the gym before finally meeting me 😉 haha I am so lucky to have both him and her! 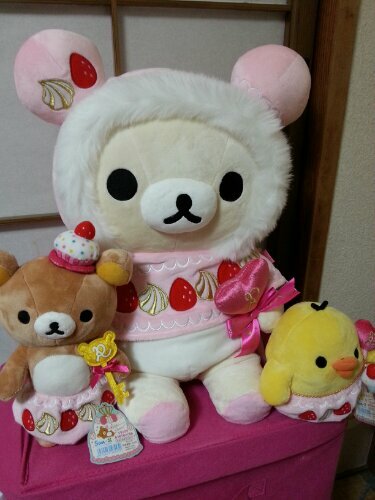 This entry was posted in Uncategorized and tagged korilakkuma, plushie, rilakkuma, stuffed animal, sweet by Angel. Bookmark the permalink. AWWWW so cute! I love the big plushies so much – I wish I had more myself! You are so lucky!